Those hot summer days are fast approaching here in North Texas. Usually they are already here by now but so far we have been lucky this summer and it hasn’t been too unbareable. Knock on Wood…. I know on those hot summer days when it’s 100+ degrees outside the last thing that we want to do is stand over a hot stove for an hour to prepare dinner. Have no fear, Meals with Mel is here with a healthy dinner perfect for those hot summer days. This Salmon recipe is quick, easy and basically foolproof. The salmon cooks in 8 minutes or less and you can have this dinner on the table in 15 minutes. Boom! Healthy, beautiful and can be on the table in 15 minutes. Who doesn’t want this recipe in their repertoire? Pre-Heat the Broiler and make sure the top rack positioned in the center of the oven. Place the Salmon Filets in a small metal pan (I use a pie pan) that has been greased with a little Extra Virgin Olive Oil. Squeeze the juice of half the lemon over the two salmon filets then sprinkle on a little pinch of salt and a little black pepper. 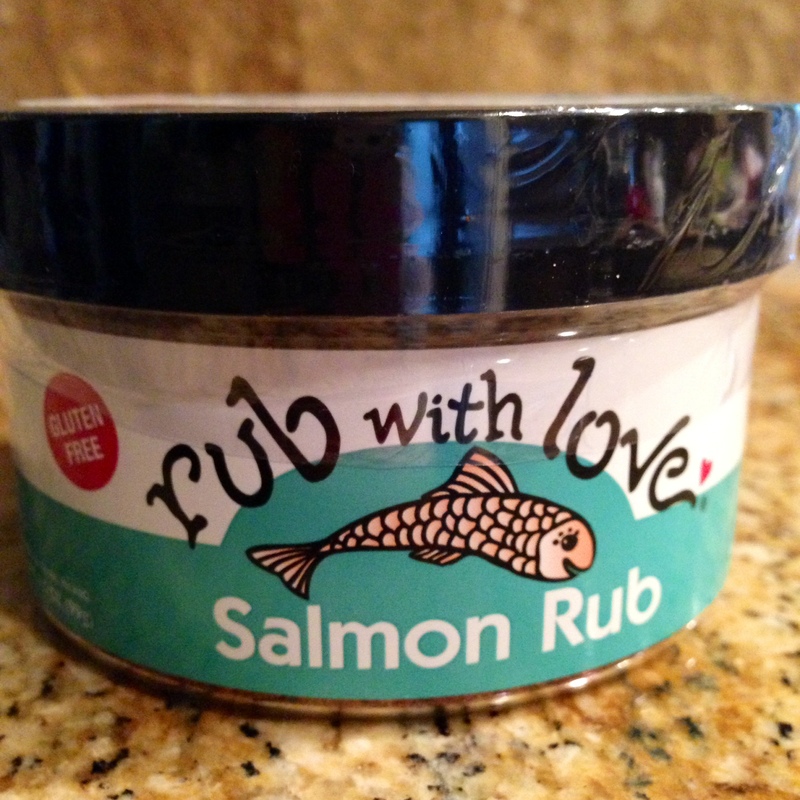 Sprinkle a Tablespoon of the Salmon Rub over each of the salmon filets and rub it in and making sure the rub is evenly distributed. Drizzle the salmon with a little Extra Virgin Olive Oil on top, and place in the oven on the center rack. Set the oven timer for 8 minutes. ** Check on the salmon after it has cooked for 6 minutes as different oven broilers will cook at different temperatures. The center of the salmon should have a little spring to it but be firm. Meaning the center of the salmon should feel like the meaty part of your thumb if you touch the tip of your thumb to your ring finger. Drizzle a little dressing around the bowl then add the lettuces, tomatoes, and croutons. Give everything a good toss. When the salmon is done immediately squeeze the reaming lemon juice over the top then cove the pan with foil. Let the salmon rest for 5 minutes. 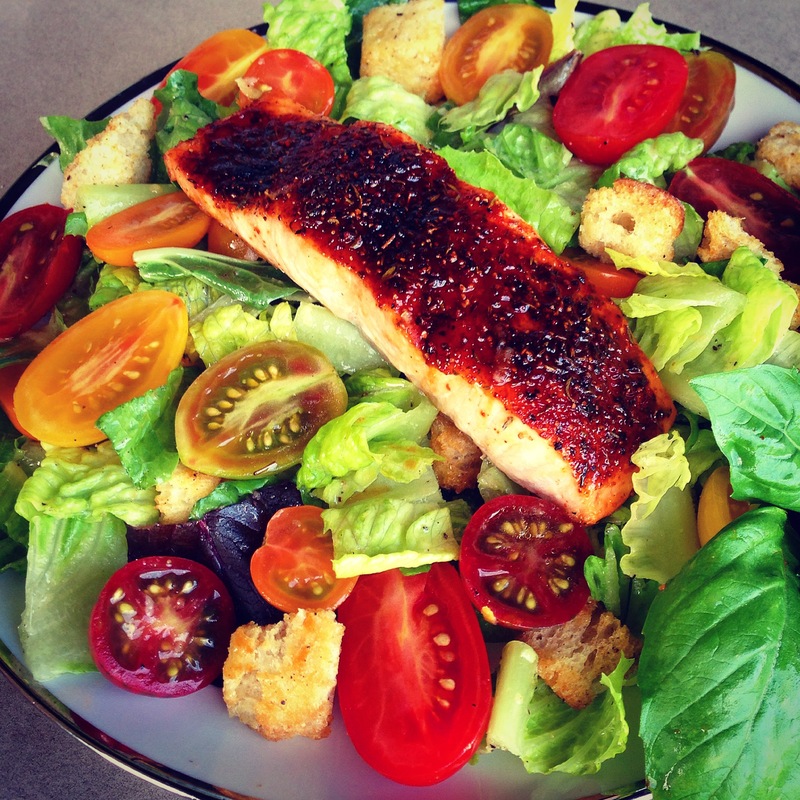 Serve the hot salmon directly on-top of the salad.